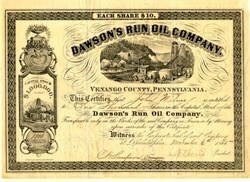 Beautiful uncancelled stock certificate from the Dawson's Run Oil Company - Pennsylvania issued in 1865. This historic document has an ornate border around it with a vignette of oil derricks and processing facility. This item has the signatures of the Company's officers. Dawson's Run Oil Company organized in 1864 under the act of 1854. The company owned a tract of 558 acres of oil and timber land on the west bank of the Allegheny River and on Dawson's Run, with room for some 250 wells, plus a Stave Mill for making staves and barrel headings, and possessed a nine year lease on an adjoining tract of 12 acres of flat land where there was room for an additional 15 or 20 wells. The company anticipated benefiting from the soon to be completed branch of the Philadelphia & Erie Rail Road to transport their product to eastern markets.